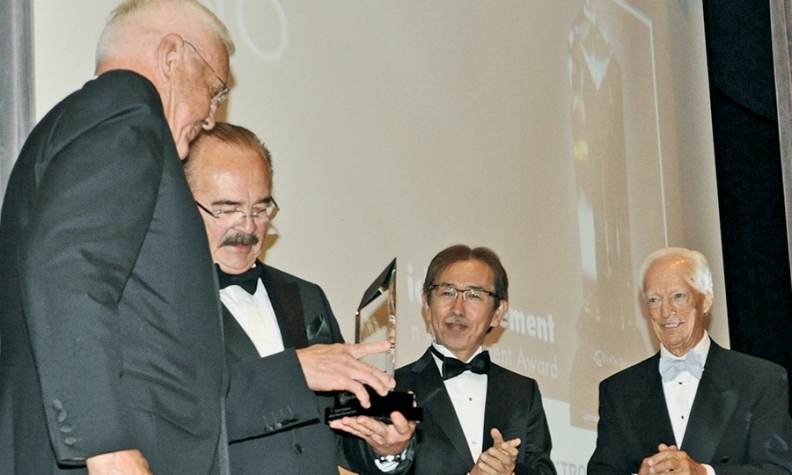 Bob Lutz, left, presents the EyesOn Design Lifetime Achievement Award to Patrick le Quement, Renault's longtime design chief. Sharing the stage are Shiro Nakamura, Nissan's global head of design, and Jack Telnack, right, former Ford design leader. DETROIT -- When it came to matters of taste and vehicle styling Patrick le Quement never could hold his tongue. The French designer, who received a lifetime achievement award this month at the EyesOn Design charity car show here, always carried a full set of strongly held beliefs. And it didn't matter who he was addressing. Early in his career at Ford of Europe, le Quement was at the vast Lommel proving grounds in Belgium on a day when senior Ford executives were testing models from several manufacturers. Bob Lutz, future Chrysler and General Motors honcho, was president of Ford of Europe at the time and was another guy who did not keep his opinions in reserve. A French car appeared with three-bolt wheels, stamped wheel wells and no wheel covers. Lutz said something along the lines of: "Now there is a typical example of lousy French design." "We discovered that we had a lot of common ground. We found we both hated bad design and loved good design, and Patrick and I developed a very strong working relationship during the time he was at Ford." Le Quement was standing nearby and immediately confronted his president. "Just what is it about French design that you don't like?" he asked. Lutz said his first thought was: "Well, there's an unusual response from a subordinate." But rather than complicating le Quement's career path, Lutz fell into a conversation with the young designer. "We discovered that we had a lot of common ground," Lutz said this month at a gala dinner celebrating le Quement. "We found we both hated bad design and loved good design, and Patrick and I developed a very strong working relationship during the time he was at Ford." Le Quement, now 70, started his career at Simca in France in 1966 and spent 17 years at Ford in the UK, Germany and the U.S. In 1985, he moved to Germany for two years to establish an advanced design studio at Volkswagen-Audi. In 1987, he returned to France as head of Renault design, a job he held until retiring in 2009. At Ford, he was associated with two landmark designs, and Lutz had a ringside seat for both. When Lutz was in charge of Ford's European truck operations, le Quement had a vision for a medium-heavy truck that became the Cargo. Unveiled in 1981, it featured smooth styling and a revolutionary new cab. Lutz said: "Patrick was the inventor of what we now see on medium to heavy trucks everywhere -- that quarter window that goes down the door, all the way down to the bottom, so that the driver can look diagonally down and see the curb for maneuvering. The Cargo truck was the first truck that ever had that." The truck was a hit all over the world, including in the U.S.
"It influenced medium heavy truck design ... forever," said Lutz. "It was a breakthrough product, and it was a good product. It was voted the European truck of the year." 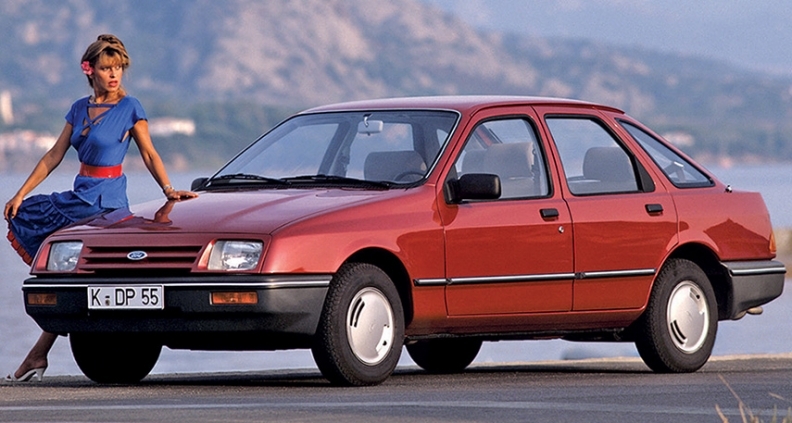 Soon after, le Quement designed the Ford Sierra, a midsize European family car that debuted in 1982. "That was a tough task because every other car company in Europe had enough money to create an all-new, east-west, front-wheel-drive platform," Lutz said. "Ford was under some financial strictures at the time and we had to stay with a heavier and less fuel-efficient rear-wheel-drive design. "We decided to get fuel economy on the freeway through aerodynamics. Patrick conceived the Sierra, which at the time had a record low drag coefficient." The design was radically aerodynamic, which did not go over well with everyone. "I loved it," Lutz said, "but many people were shocked, especially the United Kingdom, conservative as usual. People had a hard time warming to it." In time popular taste caught up with the Sierra. The 1982 Sierra midsize car was one of Patrick le Quement's two landmark designs at Ford. "That design lasted for 10 years -- two-and-a-half normal cycles with only moderate face-lifts and moderate badging changes and interior enhancements," said Lutz. "When a design can create something that is somewhat shocking at the beginning ... and the public gradually gets used to it, and it rides a crest of acceptance for a few years and then gradually tapers off ... well, if you can make that period last 10 years, the company has made a lot of money on your product." The Sierra paved the way for a generation of wind-cheating cars, and "was one of Patrick's crowning achievements," Lutz said. "I believe cultural trends affect design," he said, "and as designers we observe cultural trends and feed that back into design. But I'm a bigger believer that designers can set cultural trends, and I think that's what Patrick has done with his career. He has left a legacy of products that changed the way people think about cars." Le Quement said he still believes that national heritage should count for more in car design. "We do not see anymore the strong nationality in the cars," he said. "At one point you could see a car and you knew immediately whether it was Italian or French or American. This is less so today. I hope to see great German design, great Italian, French and of course American" design. Ralph Gilles: Le Quement set cultural trends. 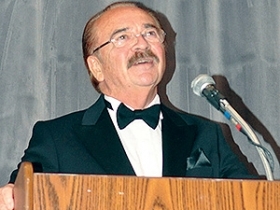 Speaking to a roomful of designers, Lutz said: "I have recently taken to advocating the notion of the designer being the highest paid -- and I'm not saying this because I want applause." Modern cars, he said, have more or less identical ride, handling, safety, number of airbags and fuel economy. "This measured quality by J.D. Power and Consumer Reports ... you don't even have to take it seriously anymore," he said. "All the cars are so reliable and so bulletproof, it just doesn't matter anymore. Everybody gets brakes from the great brake suppliers, steering from the steering suppliers, transmissions, etc." He said design is the last big differentiator in purchase motivation. Consider the movie industry, Lutz said. "When you look at Hollywood, who do you admire? Is it the head of Universal, the head of 20th Century Fox, the head of Sony Pictures? No, it's the directors and the producers, and they're the ones who are making the most money." While CEOs of movie studios get normal CEO salaries, Lutz said, "It's the creative talent, the guys that do the blockbusters who really drive revenue and shareholder value, and they are the ones who are most valuable, the rarest and the ones that should be paid the highest." No matter what Lutz said, designers in the audience were now grinning and applauding. "If I were running a car company today," said GM's former head of product development, "I would willingly pay a salary of $5 million plus bonus for the top design talent. And if I were running a car company today one of the people I would seriously look at hiring for $5 million plus bonus would be Patrick le Quement."